10 hp motor soft starter, 7.5 kW three phase 220v, 380v, 480v, 690v. Model GS2-7d5 (220v), GS3-7d5 (380v), GS4-7d5 (480v), GS6-7d5 (690v). Tips: Choose Soft Starter or Variable Frequency Drive? 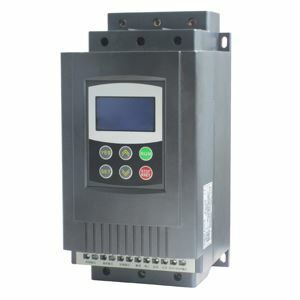 Although both variable frequency drive (VFD) and soft starter can reduce inrush voltage during induction motor starting, but soft starter can not control the frequency added to the motor, soft starter just helps to lower the induction motor starting current and smoother the start up, whereas VFD can control the frequency and it's much more intelligent and it has all the functions of soft starter. As long as the motor requires vary speed, VFD is the choice, otherwise you can go for soft starter. In case of the budget is not an issue and proper investigation of application, you may select VFD instead of soft starter.